Why did the steak get a crust? (Part 2) - Cooking With C.C. So, browning or the crust we are looking for on the steak requires a dry surface and some kind of sugar to react with the protein in the steak. 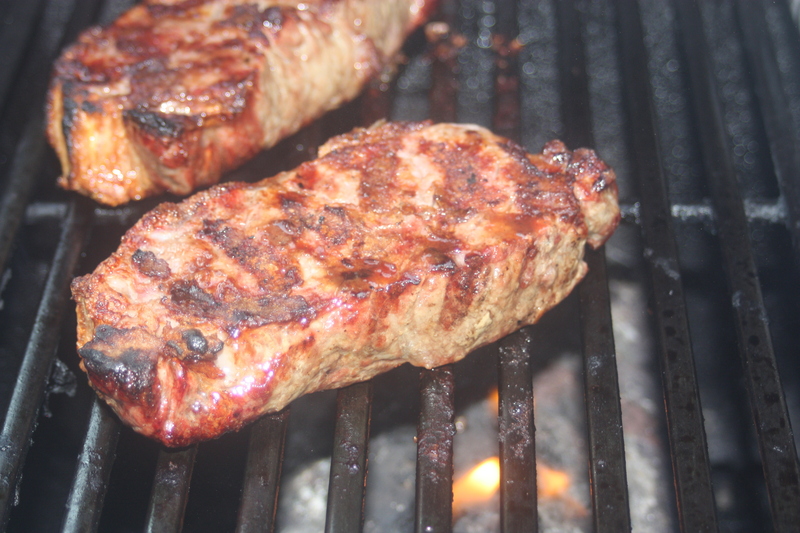 Steaks tend to be fairly wet on the surface, so the heat from the grill has to drive off the surface moisture before the browning can occur. From the steak experiment (See previous post), we started with a rub of salt and corn starch. The salt and corn starch help dry the surface of the steak. Since the corn starch is made up of long strings of glucose (Sugar) molecules, the corn starch also adds the sugar needed to react with the protein on the surface of the steak. Corn starch can be used to crisp up a variety of foods as they cook. The salt in the rub provides flavor for the exterior as well. But how does 30 minutes in the freezer help? If you’ve left anything uncovered in a freezer, you know that the air is severely dry and foods that aren’t covered lose a lot of moisture. The low humidity of the freezer also helps dry the surface of the steak. The steak is not in the freezer long enough to chill the center of the steak (since we used a fairly thick steak), but the surface is cooled further. When the steak hits the grill, this means that it can stand the hot fire for a little longer helping add the char flavor, crust and color without overcooking the middle. According to Shirley Corriher in Cookwise, the Maillard reaction requires 3 things – proteins, reducing sugars and a non-acidic environment. She also points out that reducing sugars, such as glucose, are the most reactive with proteins. Another great source of glucose is corn syrup – which can be used to coat for roasting, but would not work for the dry steaks. That’s why the corn starch and the freezer work in this experiment. next post: Finding Recipes….So Many Cookbooks – where was that one!?! ?